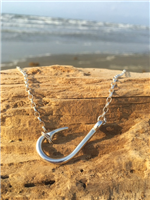 Sterling Silver 16-16 1/2" or 18-18 1/2" Sideways Fish Hook Necklace which can be worn in a variety of positions. 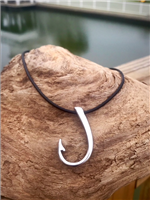 The hook measures 3/4" and hangs from a Oxidized Sterling Silver figure 8 chain 16" out of stock! Option: For a extra touch you can add on a Mahi Pendant for $43.00 or a Flounder Charm for $15.00, Special Order can take up to 2 weeks to ship. Sterling Silver Sideways Circle Hook Necklace on a 3.5 MM Diamond-Cut Open Link Sterling Silver Chain. The Circle Hook is approx.1 1/2". The Necklace comes in 16", 18" and 20"
Sterling Silver Sideways Circle Hook Leather Necklace. The Circle Hook is approx.1 1/2" and the Leather is 4MM. The Necklace comes in 16, 18 and 20"
Sizes are 16", 18", 20" and 24"
Pendant is approx. 1 1/2"